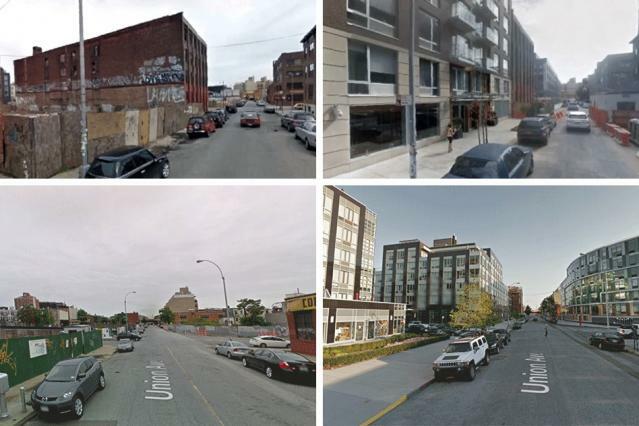 If you live in a city long enough, you see neighborhoods change over time. Sometimes trajectories of improvement or decay continue, sometimes they reverse. What are some of the factors that predict neighborhood improvement? A recently published paper in the Proceedings of the National Academy of Sciences (PNAS) takes an innovative approach to this question and some of the answers that were found may surprise you. The team of researchers from MIT, Harvard and the National Bureau of Economic Research leveraged advances in computer vision and machine learning to examine how changes in neighborhood appearance correlated with perceptions of neighborhood safety over a seven-year period. They began with pairs of images taken by Google Street View in 2007 and 2014. The images in each pair showed the same street from approximately the same location. The streets were located in Baltimore, Boston, Detroit, New York, and Washington, DC. Each image was assigned a Streetscore that was developed as a measure of how safe the street appeared to be. The Streetscore was assigned by a machine learning algorithm that was trained on a database of street images tagged with people’s perceptions of safety based on how a street looked. Tress can bias perception of safety. The Streetscore controlled for factors that could bias or distort the score. For example, people tend to rate a picture of a street as safer if it has a lot of green trees. This could distort a Streetscore depending on whether the picture was taken in the summer or winter. This biasing effect was eliminated by using computer vision techniques to identify trees which were then tagged and ignored in subsequent analyses. A measure of change in perceived safety called Streetchange was derived by subtracting the 2007 Streetscore from the 2014 score. A positive Streetchange value indicated a neighborhood had improved while a negative value indicated it had declined. The Streetchange scores were validated by comparing them with human scores for the same pairs of images and with urban development data. The human scores came from a survey carried out on Amazon Mechanical Turk, and a survey of graduate students in MIT’s School of Architecture and Planning. The urban development data came from Boston’s Planning and Development Authority. The neighborhood where a street was located was identified using US Census Bureau data. Neighborhoods were used as the basis for gauging the socioeconomic and demographic characteristics of the people who lived there. The researchers looked at relationships between demographic factors and Streetchange as a way to examine theories concerned with how the accumulation of capital in a neighborhood results in the physical improvements that increase perceived safety. They found mixed support for the theories. The research team examined the effects of population density, proportion of college educated adults, median income, housing price, rental costs, housing vacancy, race, and poverty on neighborhood improvement. College education and population density had the largest effects on Streetchange.